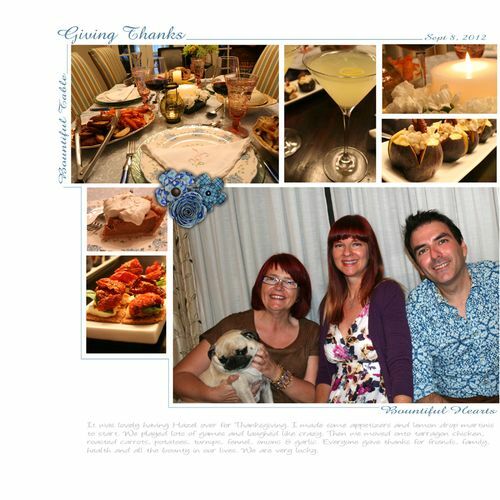 This was our Thanksgiving Monday…loved it. I made everything from scratch with recipes I created. For the appetizers I had goat's cheese stuffed figs with roasted pecans & honey, sun dried tomatoes with fresh basil, fried halloumi on rye crisps and homemade pesto cheese buns. My first try at lemon drop martinis turned out great, lethal but great. I'm glad we took the time to spend moments like this together, simply being grateful for life and each other. sounds like you made some super delicious foods! YUM! Looks like you had a great holiday Monday. (: I want to chow down on some of that food you mentioned, hehe. I also wanted to thank you for coming by my blog. When I said we had the same ombre, I forgot the part where I hadn’t posted photos of the new hair yet. (: Nooow we are twins.